Hello and welcome to Tuesday Football Live! where we'll be bringing you build-up, updates and reaction from a mouth-watering midweek line-up of Premier League fixtures. We'll also have news from the Championship, where 22 sides are in action, plus any transfer dealings as they happen. So settle in and stick with us! Valencia hits the bar, Van Persie gets the rebound and draws a fantastic save from Marshall but Van Persie puts it in at the third chance. 1-0 Man United! 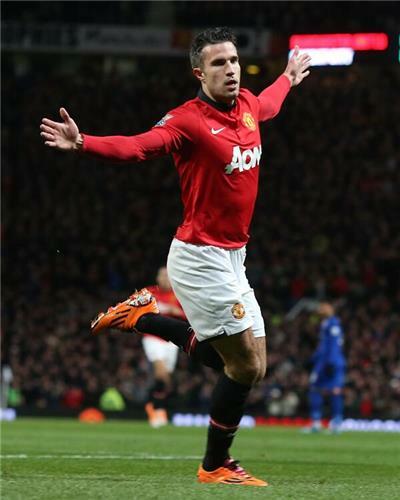 5 - Robin van Persie has scored five times in his last six Premier League appearances. Rebound. [southampton]Gunners have to work hard to clear a Saints’ corner. [southampton]Schneiderlin mis-hits his effort when the ball falls to him just outside the box. Half-chance for Saints. We're underway at both Anfield and Selhurst Park and unsurprisingly, there is an electric atmosphere at the former. CLOSE! Barkley lets rip from distance and his shot goes just inches over the bar, while Suarez and Coutinho have looked lively at the other end. Cracking start. 28 - Steven Gerrard is set to play in his 28th @premierleague Merseyside derby; more than any other player (Carragher - 27). Leader. [ouch]A clumsy Medel challenge floors new-boy Mata, while Noone fires over for the visitors shortly afterwards. SAVE! Coutinho's attempted through ball deflects to Henderson, whose shot is parried away by Howard. It's been a lively start and the atmosphere is electric! Good work from Sissoko sees him tee up Remy but his shot is well saved by Ruddy. Fulham should be ahead at the Liberty. Routlege swings in a free-kick from the right wing but an unmarked Hangelend is unable to find the target. Glorious chance for the defender. Shaw’s cross to the far post is powerfully headed home by Fonte. Keeper Szczesny gets a hand to it but can only help the ball over the line. 74 - Arsenal have now collected 74 red cards in the Premier League, only Everton (77) and Blackburn (76) have more. Rash. Leaders Leicester are on course for another win after Jamie Vardy (83) puts them 2-0 up at Birmingham. Lowry and Coke both see red as Millwall and Sheff Wed are down to 10 men but still 1-1. 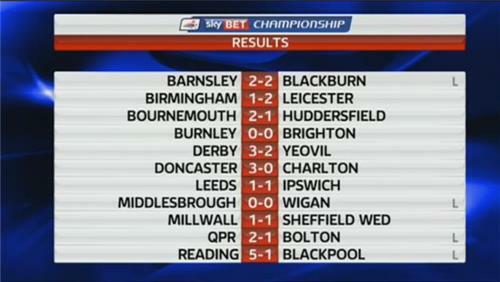 Derby have fought back to level at 2-2 with Yeovil thanks to Bryson (87). SAVE! 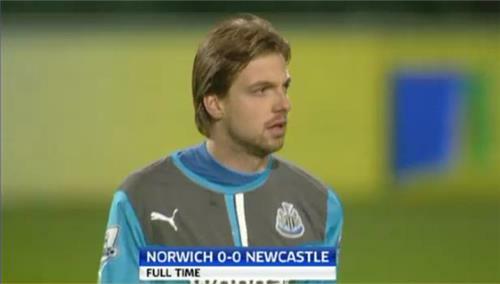 Krul comes to the rescue for Newcastle, saving Snodgrass' header from close range after he met Redmond's cross at the far post. [save]Shaw’s cross deflects off Sagna, leaving Szczesny to acrobatically push the ball over the bar. And, from the resulting corner, the Gunners’ keeper dives to his right to keep out a fierce Fonte shot. McGeady is introduced by Everton for the final 15 minutes at Anfield. He replaces Barkley. It's not Everton's night. McCarthy jinks his way through a couple of challenges inside the area and Naismith is inches away from tapping home. 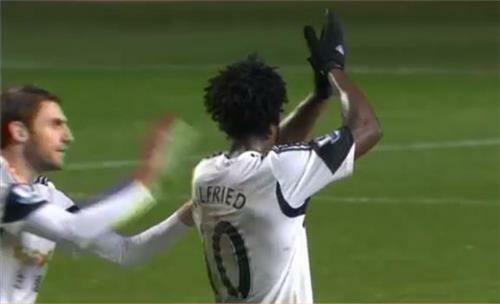 Swansea stop the rot with a deserved victory over Fulham at the Liberty Stadium. 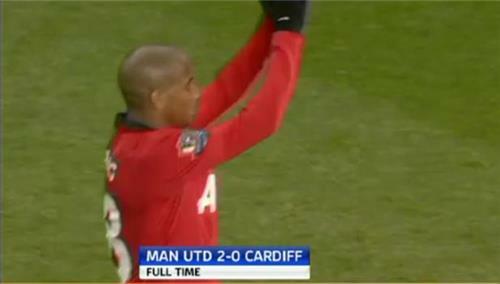 Second-half - deflected - goals from Shelvey and Chico secure a first league win since December for the Swans. [full-time]A goal in each half seals three thankful points for David Moyes. 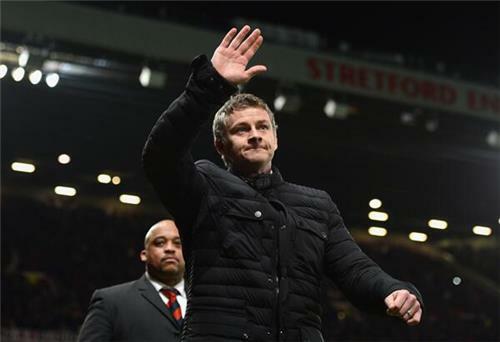 United are well-deserving if not overly convincing against a team facing the threat of relegation. A cracking contest at Carrow Road somehow ends goalless. Newcastle will consider it two points dropped after hitting the woodwork on three occasions and fluffing a number of glorious chances. Remy and Johnson saw red for a petty clash and will be pretty embarrassed with themselves when they watch a replay of the incident. [betting]Everton are finishing quite strongly and you can get 13/2 on the final score at Anfield being 4-1 to the hosts, but it’s odds-on (4/9) for no more goals. Bet in-play here. [full-time]Thriller at St Mary’s and probably a fair result. The Gunners end the match with 10 men – after Flamini sees a straight red midway through the second half. Saints score first and last on the south coast. Five minutes remaining at Anfield and the home supporters are in great voice. Everton are enjoying plenty of possession but don't look like grabbing a late consolation. Their heads have met and there's enough there for them both to get sent off. But Johnson should be really, really disappointed with himself in the way he reacted as if he'd been headbutted. That was not on at all. I'm surprised at him because I thought he was an honest pro. We had a poor first half. 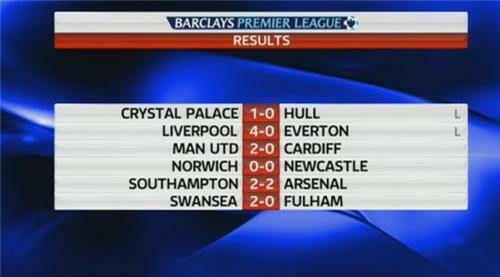 Southampton did great. In the second half we responded well - but regret of the night is to concede the second goal as quickly as that. We switched a little bit off. Secondly, to finish with ten men, because at 2-2 you can bring players on to win the game.